Book Buddies: The Remedy by Suzanne Young - Next Page Please! In a world before The Program… Quinlan McKee is a closer. Since the age of seven, Quinn has held the responsibility of providing closure to grieving families with a special skill—she can “become” anyone. Recommended by grief counselors, Quinn is hired by families to take on the short-term role of a deceased loved one between the ages of fifteen and twenty. She’s not an exact copy, of course, but she wears their clothes and changes her hair, studies them through pictures and videos, and soon, Quinn can act like them, smell like them, and be them for all intents and purposes. But to do her job successfully, she can’t get attached. Now seventeen, Quinn is deft at recreating herself, sometimes confusing her own past with those of the people she’s portrayed. When she’s given her longest assignment, playing the role of Catalina Barnes, Quinn begins to bond with the deceased girl’s boyfriend. But that’s only the beginning of the complications, especially when Quinn finds out the truth about Catalina’s death. And the epidemic it could start. To read the other half of our discussion, check out Lauren's post! 1. Do you consider this book to have a love triangle? L: I'm honestly not sure. I would say that people who dislike love triangles MAY want to stay away from it, but I feel like it's a very interesting case. Isaac is obviously Catalina's boyfriend when she dies and Quinn takes on that role way more than she should. But I agree with what Quinn says at some points - she loved being with Isaac because she really felt like a normal girl with a loving boyfriend. She got swept up into a relationship with him but it was obviously more because of the role she was playing. Her feelings got mixed up because she started to confuse who she was versus who she was playing. I really loved Deacon (for the majority of the book!) and kept feeling like it was inevitable for the two of them to be together. They weren't really dating at any point during the actual story though, so maybe it's not really a love triangle in the technical sense?! I don't knoooow. All I know is that it added a really interesting element to the story and the struggles that Closers have to deal with during their assignments. K: Yes! Totally agree with you here. Deacon and Quinn were kind of like those friends who deny their interest in each other but everyone knows other wise. They both really wanted to date each other and you can see and hear the concern and jealousy Deacon gets when he find out about Isaac. Quinn liked Deacon, Deacon liked Quinn yet they wouldn't date, it was all a typical thing. The fact that Quinn got attached to Isaac's love for Catalina through was super interesting because of the fact that it was indeed attachment to the feeling of being loved, rather than Isaac himself. I kind of consider this book to have like, a unclear love triangle if I must say? Both Deacon and Isaac were attached to Quinn but Isaac loved the idea of Catalina rather than Quinn herself. 2. Did this book give you answers on how The Program first started or answer any remaining questions you had after finishing The Program? L: Oh god I have a lot more questions! You can start to see how this epidemic got started, but not really WHY. The mystery behind Catalina's death (which I totally predicted) seems to imply the beginning of the epidemic, but there are a lot of questions about what got it started in the first place. I think this book did a great job of answering a few questions but definitely opening up a LOT more - especially at the end when Quinn starts to figure out what's going on. K: I agree! This book gave off small clues on how the epidemic started but it never really gave me the full reason. If anything, it definitely opened up new questions for me and now, I have so many questions about the epidemic and Quinn's story. The ending brought an explosion of questions so many questions as well. I would love to see a story about Deacon and I really just thought of this but if we could get a book about Brady and him before he died, that would be interesting. 3. What were your thoughts on Quinlan and what she does as a closer? L: Quinn was a really interesting character. I feel like in most books we rely a lot on the characterization of people and what their personalities are like in order to really see if we like the book. In this case, her main characterization was that she doesn't really have one. She's been a closer her whole life and really barely remembers who she actually is as a person. We don't know what she likes to do in her spare time when she's not working on assignments or really anything else about her. I think that's such a cool way of adding to the book and the struggles that Quinn has. My thoughts on closing... oh man, it's so insane! The concept of this book was incredibly unique; definitely something I had never thought of before. It was really creepy that she would even call the parents her mom and dad, even when she was just narrating in her head. It was like she really believed that she was Catalina or the other girls she's been. K: Yeah! That is what brought my initial rating down because there was no characterization with this book. Definitely a huge risk for Suzanne to take because it definitely could have gone wrong in worse ways. This book was still a great read through. I agree with what you said, closing is insane. Being another person in such a serious way to the point where you call their parents "mom" and "dad" is just weird and insane. Closing is a weird thing though, a weird concept. To have people go in and become dead people for a few days is just weird. In the beginning, I actually thought if a person would ever need a closer, they would hire one so that their spouse or loved one could get closer! (The person getting closure wouldn't know that there was a closer living in their house.) That would have definitely been a crazier situation if that were true. 4. If you were to be living in the world this book takes place, would you be/consider being a closer? L: NOPE! I don't think I could handle that. It's too creepy and weird. I'm not the kind of person who would have been mean to her or called her a "thing" like a lot of other people do in the book, but I could never imagine being one. The idea of closers (in a very general sense) seem like they may work and be a good idea... but I think they take it too far in this world. I could see a role playing session or two where the person dresses up as the child who passed away, and the parents have an opportunity to share what they'd like to say to them. It's a way of apologizing or giving advice or just "closing" the relationship. The fact that Quinn would live with these people and spend days with them seems like a bit much. Role playing could help with recovery, I think, but this was an extreme situation. K: I agree with you. Being a closer requires to be a person who has little to fulfill their needs and satisfactions and that would not work with me. I also mentioned this with your question is that, living in a house with a stranger is scary. You don't know what this person does or has done. The idea of closing is a good one, and it really could help people but the closing that took place in this book got a bit too far. And I agree with you when you say role playing, because that is also a great idea. Or another idea they could have used is rather than spending a few days with the client and living in their house, they could have just had the clients and closer spend a day together in public. That way they could still get bonding time and and there would be very less possibilities for someone to get abducted or something unfortunate like that. 5. 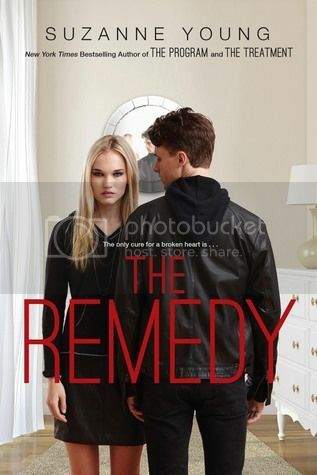 Do you recommend people read The Remedy before started The Program duology? L: I was thinking about this as I was reading. Overall I like reading books in the order in which they're published, because that's the way the author introduced them to the world. I think it's more interesting to read a prequel after reading some of the other books, because then you can see what made them happen. Maybe some of the mystery of the Program would have been gone if we had read this book first. I think you could easily read them in chronological order without it messing too much up, but I'm a firm believer in pub date over everything. I think this was such an awesome addition to this series though! K: I really wouldn't have cared on which order I read the book. I didn't need crucial information to read The Program or the Remedy so I wouldn't have missed out on any information or spoilers. The Remedy does introduce the topic of handlers and suicide that would really set the Program up for anyone who reads the Remedy then the Program. For someone who reads the Program before the Remedy, I guess it's cool to see Arthur again (At least, I'm pretty sure we saw him before?) and find out some of the back story to the start of the epidemic and handlers. Chronological order is probably the best option to go with but I honestly think it doesn't matter too much. 6. If Suzanne were to write a sequel to this book, what would you want it to be about? L: Well, it seems like she is writing one! There's a book that takes place right after this one being published in April of next year :D So, I hope that it's about Quinn again. I want more information after that epilogue. A book from Deacon's point of view may actually be REALLY interesting, so we can see what's going on in his head as he runs off with Quinn. I want some more answers about why the Program came to be and how the epidemic got started. This book is called The Epidemic, so I hope it DOES answer some questions about the epidemic! K: Oh that is great to hear! If this book will finally give me some information about how the epidemic starts that would be great and I expect that to happen. They are going to find Virginia and hopefully that will give us some answers to what really happened with Catalina and the epidemic. Reading a book is Deacon's head may be really interesting. He is such a great character and the little secrets he carries around is going to be fun to read about. Make sure to read the other half of our discussion here, on Lauren's blog!